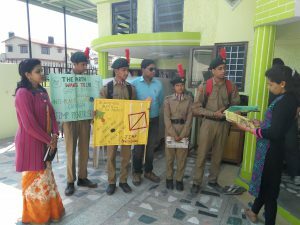 In an attempt to create awareness on the environmental hazards of plastic carry -bags and encourage the use of paper bags, NCC Cadets of Jimp Pioneer School Vill-Pitamberpur, Arcadia-Grant, Premnagar Dehradun prepared newspaper bags from wasted News papers and visited different villages of Arcadia-Grant (Pitamberpur, Baniyawala, Gorakhpur etc.) 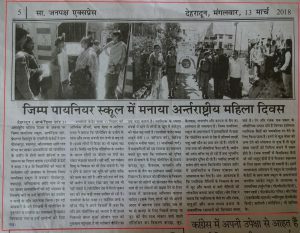 from 08-03-2018 to 13-03-2018 and created consciousness among the villagers, especially, the women. 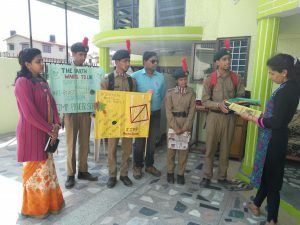 NCC Cadets of Jimp Pioneer School explained the villagers, retired people,housewives that plastic is widely used in our day to day life. Starting from a pen to a polythene bag, in which we carry fruits and books are forms of plastic. Though convenient in our day to day use, it has posed an alarming threat to the environment. Plastic is non-biodegradable and does not decay by biological action of microbes. They remain in the same state as we throw them. So, dumps or garbages are created making our cities and soil polluted. To destroy plastics, we can either recycle or burn them. If we burn plastic, it emits harmful chemical gases like carbon dioxide (CO2), carbon monoxide (CO), nitrous oxide (NO), methane (CH4), sulphur dioxides (SO2), etc. 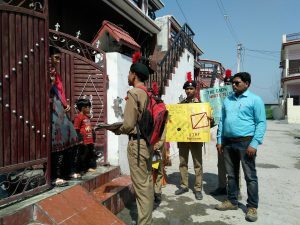 These gases pollute our environment, though in negligible content, they add to green house effect and endanger our environment. 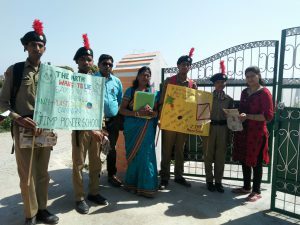 The Principal of Jimp Pioneer School, Shri Jagdish Pandey told the women that we can reduce plastic waste by using our own garment bags or paper bags when we go to the shop .He said that a paper bag can carry a weight of five to ten Kg of vegetables, provided the base of the bag is strong. 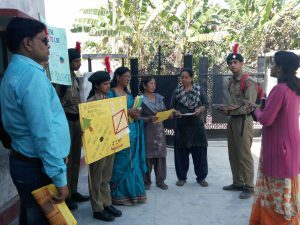 The villagers, mostly farmers, retired people and housewives found the awareness program very useful. They said the craft of making paper bags and cloth was very interesting and can be made during leisure hours. 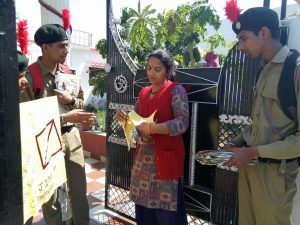 The NCC Cadets told the retired persons, who have a lot of time to start manufacturing paper bags and cloth bags on a large scale as there is large scope to market this product. Housewives of the villagers felt that making and selling paper bags and cloth bags is an ideal and cost-effective business for housewives. 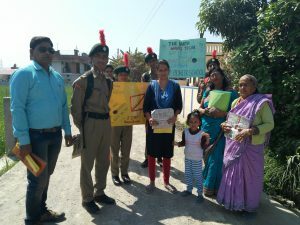 Villagers praised the efforts and work strategic of the NCC Cadets of Jimp Pioneer School for reducing the use of plastic bags.